Presented by: Eric A. Rudolph of The Law Offices of Eric A. Rudolph P.C. Specializing in Estate Planning & Living Trusts for LGBT individuals and couples. In these uncertain times it is necessary for each of us as members of the LGBTQ community to take action to prepare legal documents that will protect you, your spouse, your partner and your loved ones. 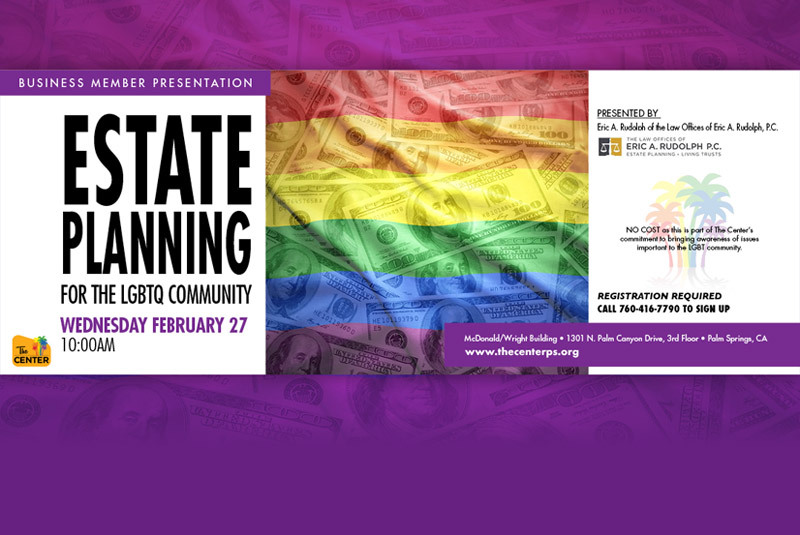 This seminar will provide important information to the LGBTQ community on preparing the legal documents you should have, including Living Trusts, Last Wills, Durable Powers Of Attorney and Advance Health Care Directives, as well as other documents that will safeguard you no matter what the future holds. Call (760) 416-7790 to sign upNO COST as this is part of The Center’s commitment to bringing awareness of issues important to the LGBT community.